Reminds me of Myles Allen's shock when David Rose misrepresented him. Again. Professional liars are quite capable of being polite and even charming. That doesn't mean they've turned over a new leaf just for you. James, the reason why people are talking about history is that RealClimate is coming up on our 10th anniversary. You'll hear more from RC on this soon. re Watts etc. I don't think you're being cynical. I think you are just stating what's true. Indeed, the downfall of previously-valuable USENET groups offers lessons about making blogs better. I still miss practical KILLFILEs, but it is clear that unmoderated discussions in any online forum eventually degrade into poor signal to noise ration, by which time those with signal leave. I wasn't doing sci.environment, but the same thing happened at comp.arch (computer architecture). First, Eternal September, then general WWW access. After ~15 years, I'd given up, as had most of the experts. In what way did it 'work out well' for Anthony Watts? Well, he got you writing a guest post, for starters! In which you appeared to absolve him of any responsibility, and generated a thousand comment thread to boot. Given that his whole m.o. is based around the false "debate" and his number of pageviews it's hard to think of any outcome he'd have realistically preferred. I've learned a lot from the inline comments at RC, especially in the beginning stages of my education. It would be most helpful to stratify comment results by those with inline responses, or even to start a system of "recommended comments" (that don't necessarily get a response), rather than getting rid of comments completely. This would help separate the signal from the noise for onlookers. Chris That sounds good but either software or a person has to do it. Much much much easier would be "letters to the editor." The default would be the dust bin, but we'd still read everything, and we'd publish the best stuff, including stuff that we disagree with but that is well articulated. *We'd get accused of "not being open". But we're accused of that anyway! *Too much work. At first, yes, but eventually only people with something to say would actually write, since it's less inspiring to write something that may never get posted. This has worked super well for a few centuries. And people can always start their own blogs if they don't feel they are being included. But the quality of the blogs would go up immensely. Hi James. I really don't think the 1000+ comments have done Anthony Watts any favours. Many of them are vile. Frankly I think they make him look silly, because a few weeks ago he posted about having a civilised discussion, then he lets his commenters give us a right kicking…. Anyway, is there a difference between me writing a post on WUWT and you reviewing a report for the Global Warming Policy Foundation http://www.thegwpf.org/content/uploads/2014/02/A-Sensitive-Matter-Foreword-inc.pdf ? Some people have been asking me if the GWPF is a 'legitimate organisation'? Do you think it is? Does having your name acknowledged in one of their reports add to their credibility? Does it bother you to be associated with them after what they've said about climate science and scientists? About RC: I think the comments with responses are extremely valuable. Once upon a time I read all the comments, but I don't think it's worthwhile any more. Comment threads here or at Stoat etc. in which the host actively participates are also useful/interesting/informative. Unmoderated blogs are hopeless, and good moderation seems really time-consuming, to the point people get tired of it ... and we still don't have a useful KILLFILE replacement. 4) DELETE, either scrub entirely, or like HIDE, with reason code, except comment is gone ... but records fact that somebody keeps getting deleted. Of course, a KILLFILE sytem that worked would be good. One obvious difference is that I was reviewing a scientific report. I don't see how I am associated with undesirables any more than the people who reviewed Nic Lewis' other papers. The authors took some of my advice but I don't endorse the whole report, as I think I blogged some time ago. Another difference is that I'm currently unemployed and they paid me. Thanks, this is turning into quite an intriguing discussion! To clarify, I personally do not have a problem with you reviewing the Lewis & Crok report. As Richard Tol has pointed out, objective scientists should be free to advise whoever they like - everyone gets the same advice. However, I do find it rather inconsistent for someone who has been paid to help the GWPF to then get on their high horse about someone else posting at WUWT. You didn’t endorse the final Lewis & Crok report and we didn’t endorse WUWT. Did it ‘work well’ for Lord Lawson after your name was included in a GWPF report? This isn’t a criticism - I just genuinely don’t see any real difference here. It seems we’ve all just tried in our own way to be constructive about something we didn’t agree with, instead of just hoping that if we ignore it, it will go away. Well I'm not really sure how to address your question. What is the difference between writing a blog post on an anti-science hate site and reviewing one of Nic Lewis' manuscipts? You might as well ask what is the difference between a shoe and a kangaroo. What is the similarity? But to be clear, I don't object in principle to you posting on WUWT, it's the claim that this "engaging with sceptics" serves any useful purpose that I question. It seems that you are rowing back from this position quite vigorously, but back when you were writing your soapbox piece in Nature, it certainly sounded like you saw it as an important step forward. Now you seem to be presenting it as nothing more than a harmless bit of fun, which may be more realistic. Well a lot of people would have a real problem with someone like yourself doing something for the GWPF, even in a scientific advisory capacity - see the hoohah about Lennart Bengtsson for example. 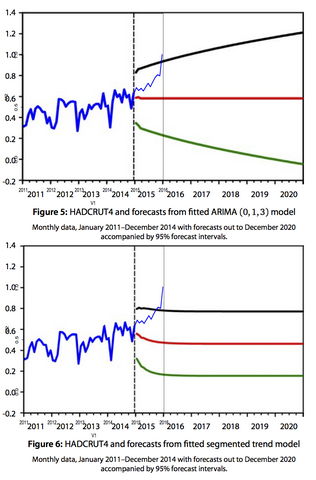 Like WUWT, the GWPF do seem to have a somewhat skewed view of climate science…. In any case, did you see the sub-title of the Lewis & Crok report that you reviewed? "How the IPCC buried evidence showing good news…." - regardless of the technical content, this is not a very usual style of title for a scientific document. It's clearly a political title. But yes, the Nature piece was nearly 3 years ago, and I'm the first to admit that my expectations are now lower. There are indeed some people with whom I have found it completely impossible to have a good-faith conversation. However this has not been the case every time, and there have been enough (small) positive outcomes (some of which the IPCC or colleagues have thanked me for) to make me think that it's not a total waste of time… but I do try to make sure it doesn't take up too much of my time. These days I view these conversations as being mostly for personal interest, with any occasional positive outcomes just being an added bonus. "my expectations are now lower"
Well, I can't say I'm happy to see that, as I did really want to give some benefit of the doubt to the new detente. I expect that different strategies will work in different situations, and certainly don't object to people trying a range of approaches (note that I did explicitly support you against some of the more silly comments, eg here). But I can't help a bit of schadenfreude, and also I can't help sympathise with some of the more vocal critics given that you seemed to blame climate scientists for the problem in the first place. I wouldn't want to join the board of the GWPF, as that implies some agreeement with goals and statements. A reviewer has no such association and there is no widely agreed policy of strict sanctions against them, so I don't think there is any real grounds for criticism of my actions any more than your dinner. Does anyone (who matters :-) ) actually have a real problem with what I did? I didn't hear of it! > What is the difference between writing a blog post on an anti-science hate site and reviewing one of Nic Lewis' manuscipts? You already mentioned money, James, and the fact that you reviewed a report. The similarity may be better observed if we complete your sentence: you reviewed a manuscript ordered by an anti-science site. Another difference would then be hate. I'm not sure about that, if we accept that our Beloved Bishop's as a blogging extension of the GWPF.